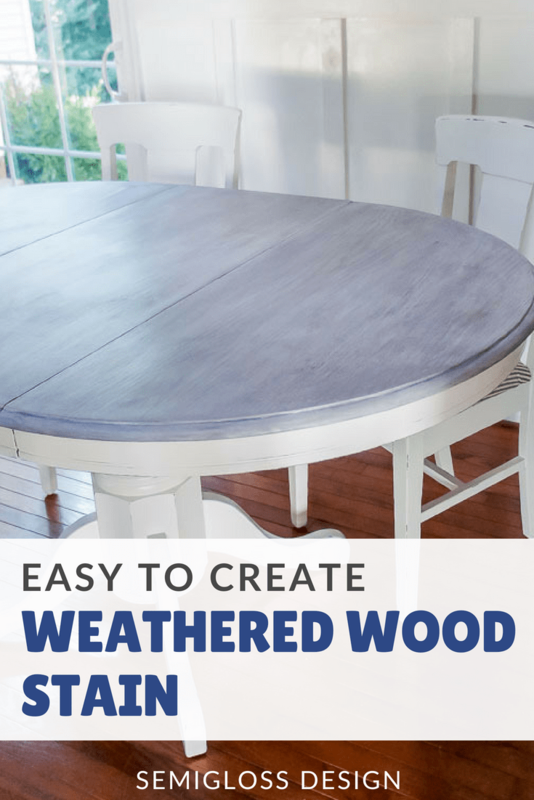 Learn the easy way to create a weathered wood stain on furniture! I hate when I’m looking up directions for something and it requires special products. Even with 2 day shipping, I want it NOW. 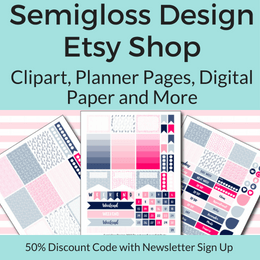 When the mood strikes to create, I don’t want to spend my time hunting down specialty items or waiting for them to ship. This weathered wood stain tutorial uses easy to find products that you might already have in your garage. This driftwood finish is perfect for a coastal look. It’s in my booth at Sweet Clover this month with my ombre dresser and together, my booth has some serious summer vibes happening. Weathered wood is wood that has been outside subjected to the weather for a long time. It results in a beautiful gray color. However, leaving wood outside for long periods of time isn’t possible for most furniture. If I left this table outside for a few months, it would fall apart because the wood would warp. And in reality, weathered wood can be pretty gross and dirty. We have a pile of lumber that has weathered naturally and it always needs to be cleaned and sanded to make it usable. No one wants moldy wood, which is the reality of real weathered wood. So making a weathered wood stain is desirable. 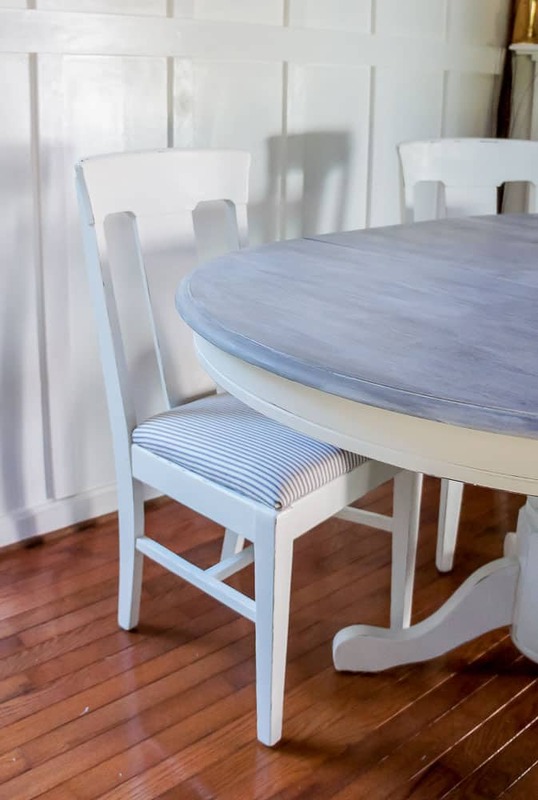 This look is also known as a driftwood finish and is perfect for a beachy, farmhouse look. 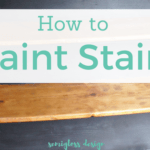 Can you put a dark stain over a light stain? If your wood is already finished, it has a top coat that will not allow the stain to penetrate. It needs to be sanded, but I would suggest stripping the finish for the best results. The only time dark stain works over lighter stain is if you use gel stain. This technique does NOT use gel stain. Can you stain pine wood? Yes, but I suggest using a wood conditioner for best results. Just paint it on and stain within a few hours. Pine has yellow undertones, so the finished results will slightly vary. You might need more coats of gray to combat the yellow. *Don’t have Minwax Whitewash? Water down some water paint and use that instead. It should work similarly since the Whitewash is water-based anyways. If you’re using raw wood, skip the stripping step, but make sure that your wood is nice and smooth with sandpaper. Even if you’re going for a rustic look, no one likes splinters. Strip the wood. I like citristrip. Just paint it on with a disposable brush and let it sit for about 20 minutes. You can apply plastic to it if it’s hot and the gel starts to dry out. 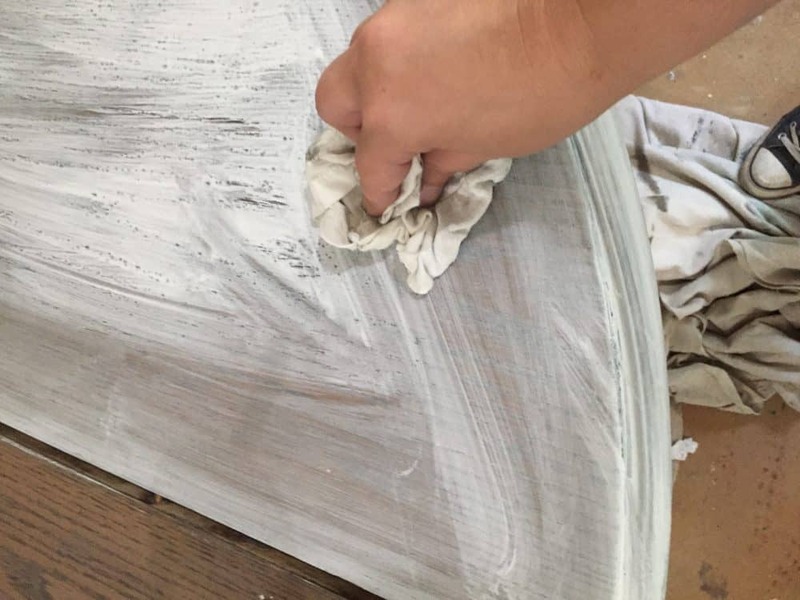 Use a plastic scraper to remove the layers of paint. Dispose of the paint in a box or bucket. Reapply the citristrip if necessary and repeat the scraping until it’s clean. Clean the citristrip with mineral spirits and a disposable rag. 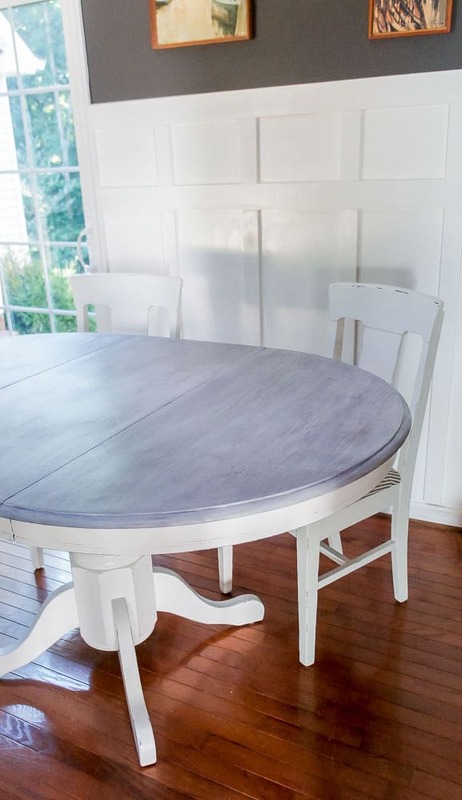 When it’s dry, you can sand to remove any leftover bits of paint or stain. Start with 80 grit sandpaper and work your way to 220 grit to make the surface smooth. *Alternatively, you can also just sand. 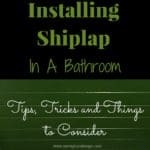 This works best for stained surfaces. Start with 80 grit sandpaper and work your way to 220, changing out the sandpaper as you go. The key to this stain is layering colors. You can use as many layers as you want to get the desired effect. This also makes it harder to mess it up. If you hate the results, add another layer and see how you feel. Keep in mind that it looks better when you step away from it and look at it as a whole than up close. You’re mimicking natural weathered wood, so it will not be perfect. Any imperfections make it look more realistic. 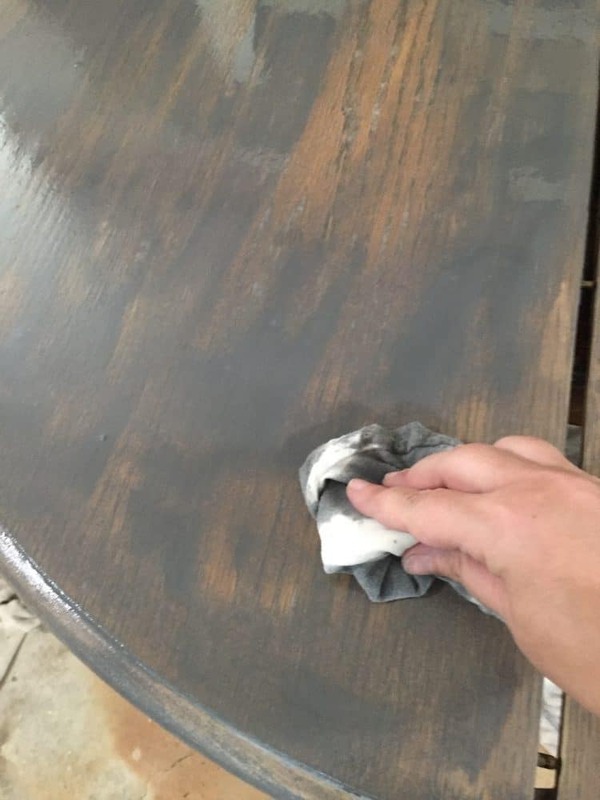 Apply a coat of Minwax Classic Gray Stain using a foam brush. I worked in sections so that it didn’t dry too fast. 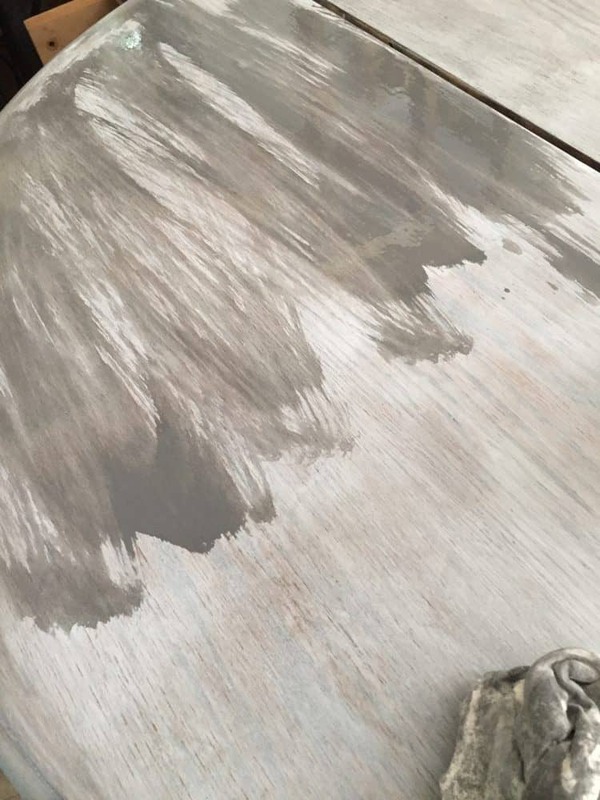 When 1 section was coated in stain, it’s time to wipe it off with a rag. I like to use old t-shirts that I cut into squares. Remove as much excess stain as possible. Continue onto the next section and repeat until your wood is done. If you have places where the wood meets, it will stain darker if you overlap because stain is transparent. 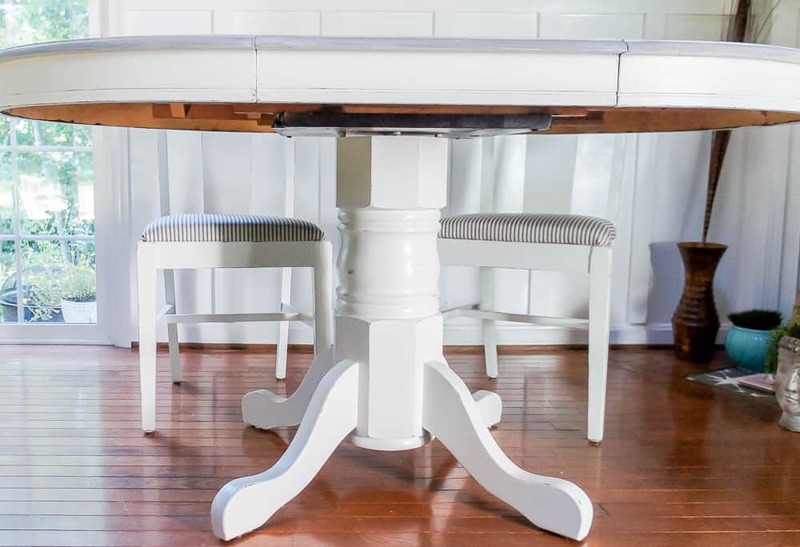 Apply a coat of Minwax Whitewash. This stain is water based, so you have to work much faster, in smaller sections. Wipe off your first area. Apply the next section and be careful not to overlap. 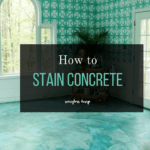 Wipe this area off, being careful not to overlap onto already stained areas. It will leave darker white marks. Continue until your wood is finished. I hated the results, so I kept going with another coat of Minwax Classic Gray Stain. Wipe it off like before. If you like it at this point, move on to the top coat section. 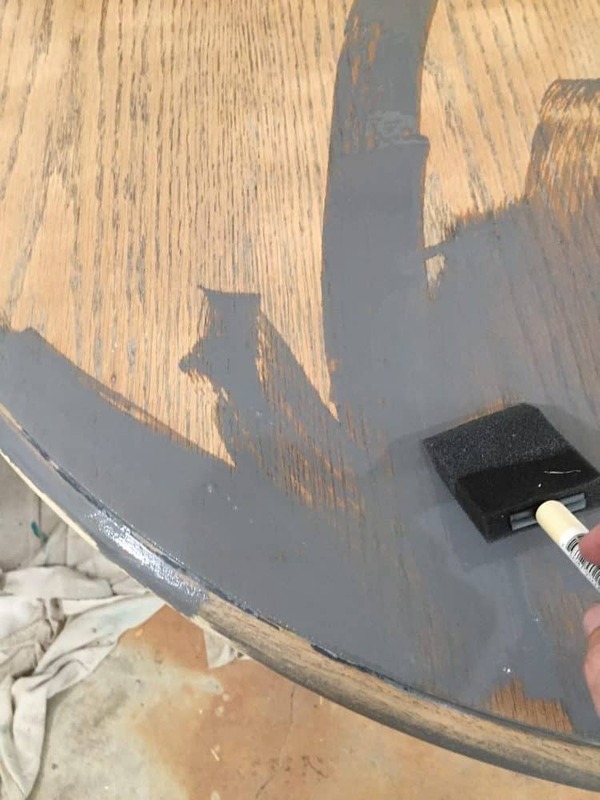 If it needs more work, add another coat of stain. Gray makes it darker and white makes it lighter. Let your final coat of stain dry overnight. Apply a coat of polycrylic with an automotive sponge. Polycrylic will not yellow over time. Wear gloves for this if you want. Just dip it in and wipe it on. It creates a smoother finish than a brush. Let it dry. If you find that your finish feels bumpy, let it dry and sand it very lightly with 400 grit sandpaper. This will smooth it back out. Add a few more coats of polycrylic. Why use an automotive sponge for polycrylic? It provided a much smoother application of polycrylic. The coats are thin, so they dry fast. You can use a foam brush to apply polycrylic, but I still find that the finish is uneven and streaky. 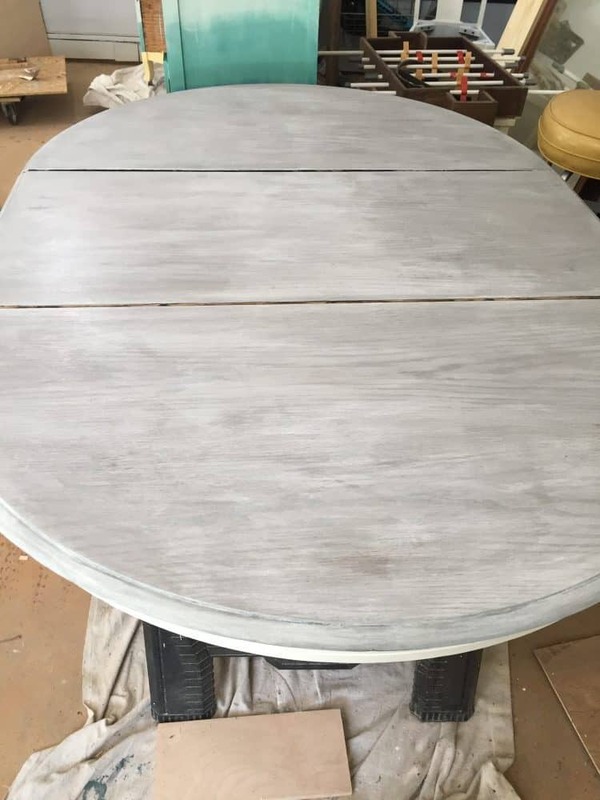 The base of this table was primed and painted with Valspar chalky paint in kid gloves, then lightly distressed. Then it was finished with a few coats of polycrylic as well. The sponge method works very nicely on chairs. 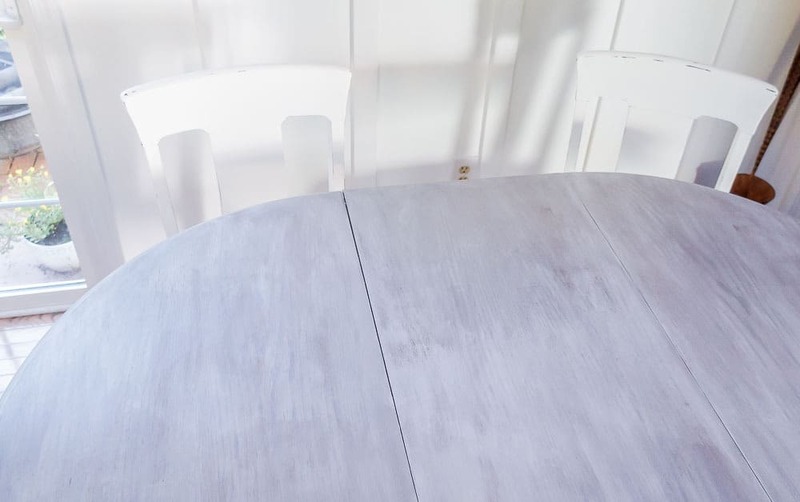 Check out my tips for painting dark furniture white! 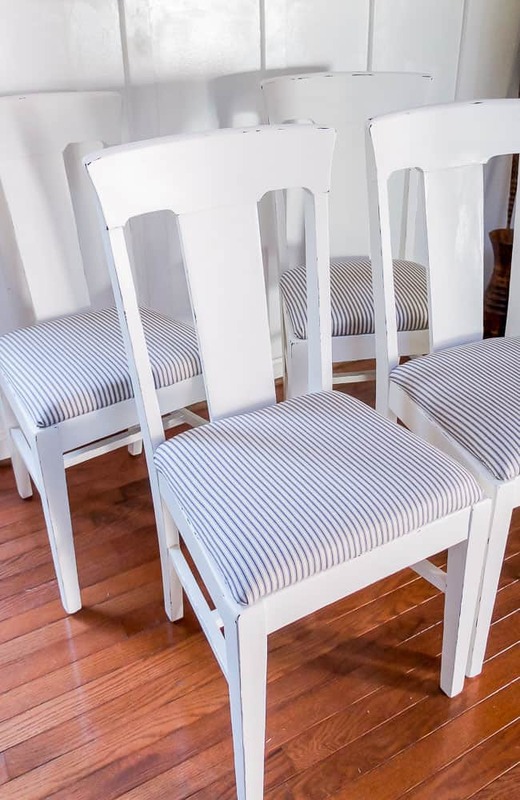 The chairs were reupholstered in classic ticking fabric for the perfect, beachy look that is perfect in almost any home. This set isn’t my normal style, but it’s so classic that it could work nicely with almost any decor. Change the accessories and chandelier for different looks. I love the weathered wood stain! 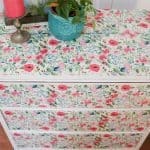 Check out my other furniture makeovers here! Previous Post: « Easy Summer Vase DIY in Just 6 Steps!